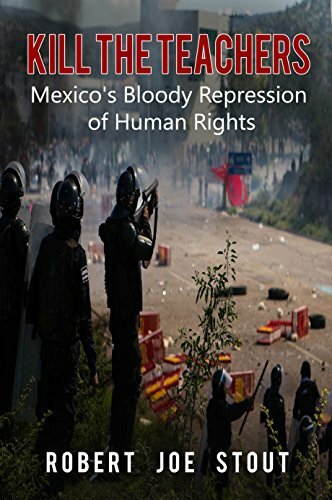 Terrifyingly gritty is the world within Kill the Teachers: Mexico’s Bloody Repression of Human Rights by Robert Joe Stout. Reader will not find a kind world in this historical retelling of events from the not-so-distant past. Corruption, suppression and oppression are what wait for readers within these pages. It is important to read about the past in order to learn from it: to prevent ourselves from making the same mistakes again. However, learning is not the same for everyone. The brutal history of Oaxaca, Mexico is what readers are going to find themselves thrown into within this book. This small area that has never quite advanced with the rest of the country where dangerous men with big ideas crushed the spirits of those who lived there. Sometimes even ending their lives. This book is a carefully researched and written recounting of life in Oaxaca. There are interviews with those directly in attendance of the rallies and demonstrations those who wanted reform. These first-hand accounts bring home the reality of what people were facing in this tiny state. Stout crafts his retelling of the events in his novel in easily digestible chunks. It is easy to be overwhelmed with the history, politics and subterfuge in books like this. Those who are not history buffs may be turned off by the content at first, thinking it too dense for their enjoyment. They’re not wrong, as a lot of information is covered in this book. This is not something you pick up to read while relaxing in the backyard. That being said, the layout and the formatting of the book are reader-friendly. The chapters are peppered with quotes from interviews and the content is presented in a way that makes it easy for readers to absorb the information they are reading without feeling like they signed up for an intensive history course. The data is dense, but it is not difficult as it flows like a novel would. It is not dry and boring. It is easy to see that Stout had a competent editor as the errors in grammar and style are minute. It is not easy to share the fragmented history to a world that is not familiar with its roots. Stout appeals to the reader in such a way that learning happens naturally. Those who are looking for a political or historical thriller will find their needs met with Kill the Teachers: Mexico’s Bloody Repression of Human Rights by Robert Joe Stout as he shares the non-fiction reality of Oaxaca, Mexico. This is the real-life story of a state that has a bloody history. At times, this information is devastating to read, especially when the reader realizes that this did not take place hundreds of years ago, but within the last half-century. However, this truth is something that we should not avert our eyes from, but learn from instead.